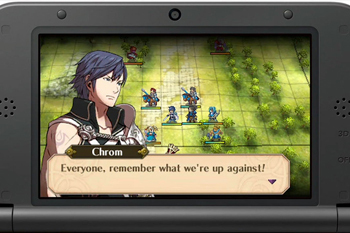 The first 3DS entry in the Fire Emblem series allows your characters to marry and have children for the first time. It's been over five years since the last original game in the Fire Emblem series was released, which is a long time for tactical RPG fans to have to wait. Luckily for them, the wait is almost over: Nintendo has announced that Fire Emblem: Awakening will be released in North America in February 4. European gamers will have a little longer to wait; Awakening is scheduled for an April 2013 in Europe. Awakening was (kind of accidentally) announced at E3 earlier this year; the game has been out in Japan since April 2012. Though this is the first entry for the 3DS, the series is no stranger to portable systems. The first Fire Emblem to be released outside of Japan hit the Game Boy Advance in 2003, with Fire Emblem: The Sacred Stones hitting the handheld two years later. Fans of the Fire Emblem games can expect new features in the next entry in the medieval fantasy franchise, like being able to perform team-up attacks, marry, and have children with other characters. Awakening will offer additional characters via DLC once the game is released, including some familiar faces from other Fire Emblem games.